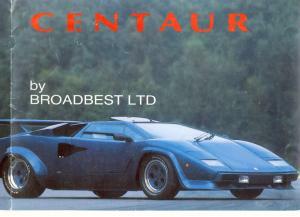 The Broadbest Centaur was one of the early adopters of the Lamborghini Countach replica race. This was a period where a few manufacturers came onto the scene and offered kits but very few if any offered completed cars for testing. It's not known how many actually ended up as driveable cars. The Centaur was a one piece GRP body tub on top of a space frame chassis. Claimed all up weight of 1100kg (dubious). A big problem for these cars in the day was panel fit, especially the doors, something to watch out for.